According to Safe Routes to School, “In 1969, approximately 50% of children walked or bicycled to school, with approximately 87% of children living within one mile of school walking or bicycling." Fast forward four decades and things have changed. Although the National Household Travel Survey notes that most children still live within an easy two miles of their school, fewer than 15% of all kids now walk or bike to school. In surveys, a full three-quarters of parents say they drive their children to school in a private vehicle. Why the switch? Surveys and research note that parents are skittish about "stranger danger," auto accidents and other safety issues. Some parents just don't want to argue. For example, when the Bellevue School District asked parents why they'd drive a kid just a few blocks to school, one parent said, "You have to pick your battles. I have one child who would love to walk to school everyday and I have another kid who doesn't like the cold. She doesn't want to bundle up. It's just easier to have that routine." A full 75% of parents in another survey said that they drive their kids less than 2 miles to school for the sake of "convenience." Yikes. Here's what we think - there are countless excellent reasons to make your kids walk to school. Keep reading to see why. Childhood obesity rates are out of control and have more than tripled in the past 30 years. Though some believe 30% is far too low an estimate and it doesn’t include simply overweight kids. All in all, there are plenty of overweight kids around. Surveys show that parents know about childhood obesity but most don’t believe it affects their own family. In fact, research shows that 80%+ of parents of overweight kids think their kids are “perfectly healthy.” First, know that weight denial doesn’t equal truth or health. Excess weight, especially excess belly fat is a serious health issue for kids. Experts agree that the childhood obesity epidemic is caused by multiple factors, but a key factor is that kids today lack physical activity. In many cases, some kids have a total lack of physical activity in their world. Not cool. A lack of physical activity and excess childhood weight are linked to poor motor coordination, physical brain changes and poor cognitive skills, and an increased risk for coronary artery disease, stroke and type 2 diabetes, among other things. Making your kid walk to school is the perfect way to work more exercise into your child’s day and get your kid used to being more active. It’s a small step yes, but all those small healthy steps you take add up and your kid will benefit. Seriously, don’t let your kid’s only view of the outdoors be from behind glass. That’s not healthy. You may think, “Why encourage bravery? 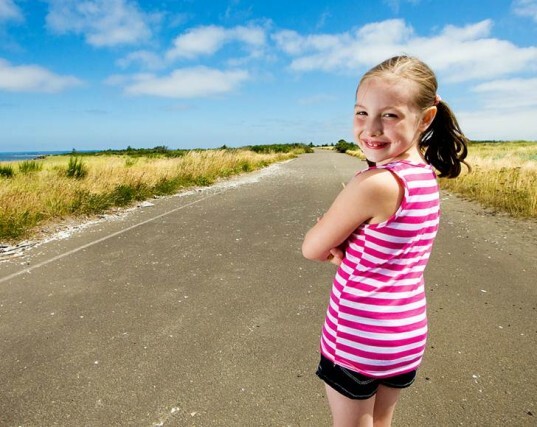 My kid isn’t a young warrior!” Your kid may not be a warrior, but she has a long road ahead of her — and one day, you won’t be there, so she’ll have to figure stuff out on her own. That’s a fact, yet many kids today are lacking bravery and independence. I know 15 year-olds who are scared to ride a city bus or be alone under any circumstance. I know 17 year-olds who don’t go anywhere unless driven there by a parent due to fear and lack of ability. I know parents so scared of “stranger danger” that they won’t even allow their older-than-10-year-old kids to play outside or go anywhere unattended. If you’re cool with your kids living with you forever, or maybe you want to drive them to work 10 years from now, by all means, proceed with overprotecting your kids. You’ll be in good company as about 14 million adults still live at home with their parents. However, be aware that it’s detrimental to your child’s health to create a world kids are too scared to participate in. Teens, pre-teens and even kids can safely walk a few blocks to a destination or ride a city bus, yet according to research a full 75% of parents keep their 10 to 15 year-old kids under total house arrest, never allowing them to leave the house without adult supervision. Youth bravery in new situations is seriously underrated nowadays, but growing healthy, happy, independent kids means letting said kids out of your sight once in a while. Think back to your own childhood. I bet you were playing outside, getting into messes and having a blast. The world is safer now than ever before. If you survived childhood, guess what? In all likelihood, your kids will too. Even if you kick them out and make them walk to school. Kids today may not know this, because they’ve been raised in a world addicted to cars, but kids of yesterday know that walking to school can be fun. You get to pal around with your friends, find cool shortcuts, talk, laugh and relieve some of that impending school stress before your day starts. To increase the fun factor for your own kids, make sure other parents in the area are on board with having their kids walk to school too. One is a lonely number. More kids equals more fun. Also, keep in mind that kids exposed to the great outdoors are happier than kids who aren’t. Image by bdayoui via sxc. Pure and simple. 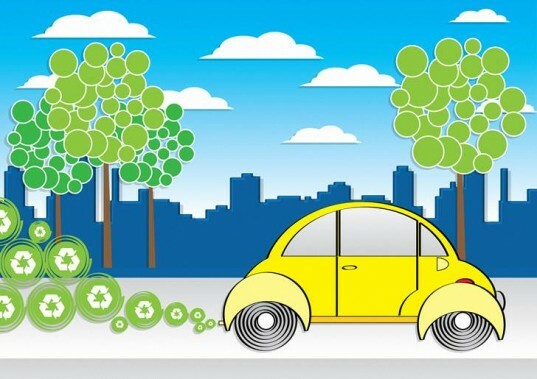 Driving increases your carbon footprint. Kids who are exclusively driven everywhere, well, imagine their tiny footprints. Not so tiny are they? 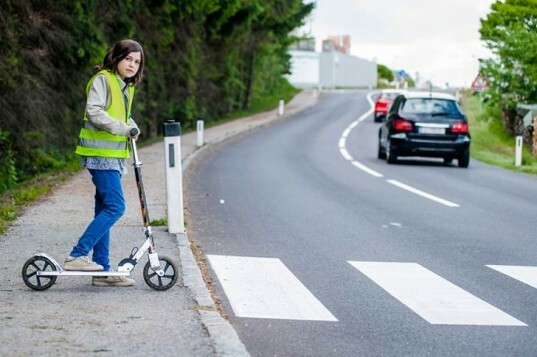 Walking school bus programs in Europe (pdf) have successfully cut down on 2160g of CO2 simply because kids are walking or biking or skateboarding to school. Read a full report (pdf) about five communities that have made strides in reducing carbon dioxide emissions and harmful pollutants around schools through the implementation of walk to school programs. A safety analysis by the California Department of Transportation estimated that the safety benefit of programs that encourage walking to school result in up to a 49% decrease in childhood bicycle and pedestrian collision rates. Driving all these American kids to school results in a ton of traffic and traffic accidents. By driving your kids to school, when they could walk, you’re directly affecting traffic rates, accident rates and the safety of kids who are trying to be healthy by walking to school. First repeat after me, “I am NOT a bad parent if I make my kids walk to school.” Didn’t kick in? Say it again! Dealing with upset kids: Some kids whine, some kids fight and some kids plain freak out if you mention physical activity. Get over it. As a parent, your job is not to be your child’s cool friend. Good parents, like it or not, are not well-liked 100% of the time. Good parents DO however make sure their kids invest in healthy behaviors, like eating right, brushing teeth and yes, exercising. Making your kid walk to school won’t kill them and in fact you’ll be creating healthy habits for life. Later on they’ll thank you. Dealing with worry: If you’re concerned, walk with your kids the first few times. Help them map out safe routes to school. Teach your child basic safety rules. If you don’t have crossing guards in your neighborhood, talk to the school about getting some. Once you see how boring and mostly safe the world is, you’ll feel better. Still worried? Read Free Range Kids stat. Still worried? Consider a Walking School Bus, where everyone walks to school together. Dealing with the whole darn issue: Not sure how to get your kids walking, biking or otherwise self-transporting themselves to school? It’s not that hard and the Safe Routes to School (SRTS) program can help. At the SRTS website parents can access a program toolkit, which includes a “how-to” guide on hosting a successful Walk and Bike to School Day, reflective stickers for bikes and helmets, event signage for schools and more. Contact your local school or your city government to find out if your community already has a SRTS program in place. If your community does not have a SRTS program, here’s how you can get a program started locally. Visit the SRTS Resource page for more info. You can do it! : You don’t even need a program like SRTS or Walking School Bus. Programs like this are cool, but all parents really need is to hand a kid a pair of shoes and say, “Go walk to school!” Easy as pie. Childhood obesity rates are out of control and have more than tripled in the past 30 years. Though some believe 30% is far too low an estimate and it doesn't include simply overweight kids. All in all, there are plenty of overweight kids around. Surveys show that parents know about childhood obesity but most don't believe it affects their own family. In fact, research shows that 80%+ of parents of overweight kids think their kids are "perfectly healthy." First, know that weight denial doesn't equal truth or health. Excess weight, especially excess belly fat is a serious health issue for kids. Experts agree that the childhood obesity epidemic is caused by multiple factors, but a key factor is that kids today lack physical activity. In many cases, some kids have a total lack of physical activity in their world. Not cool. A lack of physical activity and excess childhood weight are linked to poor motor coordination, physical brain changes and poor cognitive skills, and an increased risk for coronary artery disease, stroke and type 2 diabetes, among other things. Making your kid walk to school is the perfect way to work more exercise into your child's day and get your kid used to being more active. It's a small step yes, but all those small healthy steps you take add up and your kid will benefit. Seriously, don't let your kid's only view of the outdoors be from behind glass. That's not healthy. You may think, "Why encourage bravery? My kid isn't a young warrior!" Your kid may not be a warrior, but she has a long road ahead of her and one day, you won't be there so she'll have to figure stuff out on her own. That's a fact, yet many kids today are lacking bravery and independence. I know 15 year-olds who are scared to ride a city bus or be alone under any circumstance. I know 17 year-olds who don't go anywhere unless driven there by a parent due to fear and lack of ability. I know parents so scared of "stranger danger" that they won't even allow their older-than-10-year-old kids to play outside or go anywhere unattended. If you're cool with your kids living with you forever, or maybe you want to drive them to work 10 years from now, by all means, proceed with overprotecting your kids. You'll be in good company as about 14 million adults still live at home with their parents. However, be aware that it's detrimental to your child's health to create a world kids are too scared to participate in. Teens, pre-teens and even kids can safely walk a few blocks to a destination or ride a city bus, yet according to research a full 75% of parents keep their 10 to 15 year-old kids under total house arrest, never allowing them to leave the house without adult supervision. Youth bravery in new situations is seriously underrated nowadays, but growing healthy, happy, independent kids means letting said kids out of your sight once in a while. Think back to your own childhood. I bet you were playing outside, getting into messes and having a blast. The world is safer now than ever before. If you survived childhood, guess what? In all likelihood, your kids will too. Even if you kick them out and make them walk to school. Kids today may not know this, because they've been raised in a world addicted to cars, but kids of yesterday know that walking to school can be fun. You get to pal around with your friends, find cool shortcuts, talk, laugh and relieve some of that impending school stress before your day starts. To increase the fun factor for your own kids, make sure other parents in the area are on board with having their kids walk to school too. One is a lonely number. More kids equals more fun. Also, keep in mind that kids exposed to the great outdoors are happier than kids who aren't. A safety analysis by the California Department of Transportation estimated that the safety benefit of programs that encourage walking to school result in up to a 49% decrease in childhood bicycle and pedestrian collision rates. Driving all these American kids to school results in a ton of traffic and traffic accidents. By driving your kids to school, when they could walk, you're directly affecting traffic rates, accident rates and the safety of kids who are trying to be healthy by walking to school. First repeat after me, "I am NOT a bad parent if I make my kids walk to school." Didn't kick in? Say it again! Dealing with upset kids: Some kids whine, some kids fight and some kids plain freak out if you mention physical activity. Get over it. As a parent, your job is not to be your child's cool friend. Good parents, like it or not, are not well-liked 100% of the time. Good parents DO however make sure their kids invest in healthy behaviors, like eating right, brushing teeth and yes, exercising. Making your kid walk to school won't kill them and in fact you'll be creating healthy habits for life. Later on they'll thank you. Dealing with worry: If you're concerned, walk with your kids the first few times. Help them map out safe routes to school. Teach your child basic safety rules. If you don't have crossing guards in your neighborhood, talk to the school about getting some. Once you see how boring and mostly safe the world is, you'll feel better. Still worried? Read Free Range Kids stat. Still worried? Consider a Walking School Bus, where everyone walks to school together.